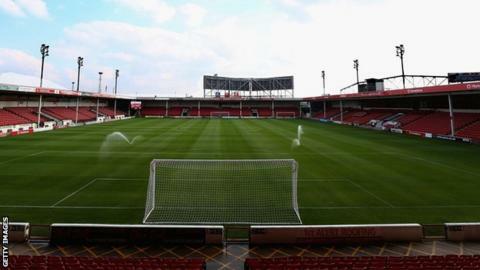 League One club Walsall have announced a profit for the 10th season running. The Saddlers, who reached Wembley for the first time in their history by getting to the Johnstone's Paint Trophy final, turned in a trading profit for the 2014-15 campaign of £26,000. Chairman Jeff Bonser also announced that the club's long-term debt has been reduced by a further £144,000. "We have continued to enjoy fantastic support from all of our sponsors and commercial partners," he said. "It was a historic year as, some 127 years after the club was founded in 1888, we made our first ever appearance at the 'Home of Football'. Dean Smith's soaring Saddlers . . .
Walsall are going even better so far in the 2015-16 campaign. Dean Smith's men currently stand second in the table after losing just once in their first nine League One matches. They also reached the third round of the League Cup, attracting a crowd of 10,525 for last week's visit of Chelsea. "On the day nearly 30,000 Saddlers supporters made their way to the capital to get behind the team and whilst we didn't achieve the result we all wanted, it was a day that will live long in the memory. "Unfortunately, we could not match the excitement generated by the 'cup fever' in the league but did secure a credible and comfortable mid-table finish, which again saw the team win the 2014-2015 FA respect and fair play award for League One for a second successive year." Walsall are flourishing off the field too, earning as much from their prominent motorway advertising signs, flourishing Sunday market and pop concerts - Sir Elton John topped the bill at Bescot in June - as they do from their average Saturday afternoon gate receipts.